Are you someone’s Mum, Dad or Carer? The Parent and Carer Network are here to represent you. This network can help you find other parent and carer students, get your voice heard and influence lasting change to ensure students with caring responsibilities get the absolute most out of university. 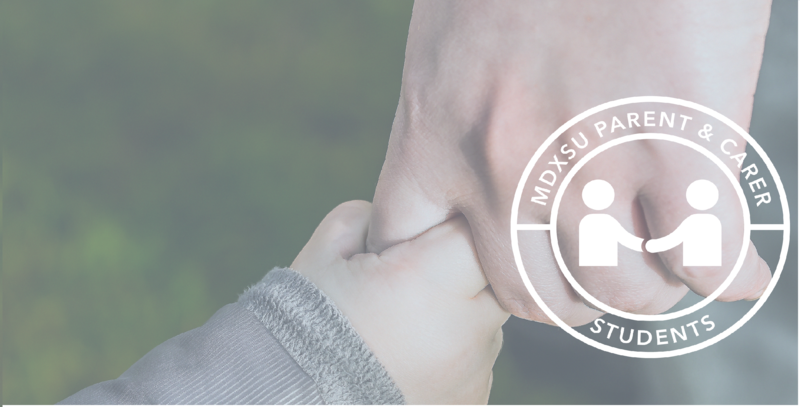 MDXSU wants to know if your circumstance impacts your studies to make sure we do as much as we can to help. Children of student parents are welcome in all communal areas of campus. From the Quad to MDX House to the various cafés in different buildings, we intend for all our spaces to be open to families. Middlesex University has an on-campus nursery available for staff and student parents to use. The team there are always happy to have a conversation regarding whether their service is right for you and your family, and you can contact Sarah Vipond, Head of Childcare, on 020 8411 6208 or s.vipond@mdx.ac.uk. We'd love to hear from you! If you'd like to get involved or have any feedback, please get in touch with Hannah Keating, Student Communities Development Coordinator.